DO NOT pretend that you don't want this. 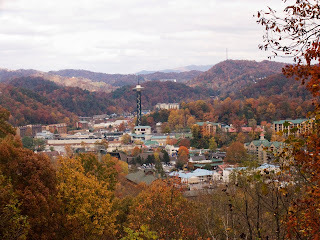 As I mentioned in my previous blog about the Smokies, the nearby towns of Gatlinburg, Pigeon Forge and Sevierville have to be considered one of the great meccas for tourist traps in the US. There are dozens of attractions that range from mini-golf to go carts and bungee jumps. There are oddball museums, cheesy redneck shops and several outlet malls. There are TWO Nike Outlet shops located on different sides of Pigeon Forge. The traffic is so terrible in this town that by the time it takes you to drive from one Nike store to the other, your brand new shoes will be officially out of style. Actually, chances are that they already are since we're talking about an outlet store here. Because there are so many mini-golf courses in the area, each one has to create a unique twist to attract tourists. Ripley's operates two places, one based on Davey Crockett and another on Old MacDonald (as in EIEIO MacDonald). There is a Hillbilly Golf in Gatlinburg that is based on, as you might guess, hillbillies. What truly makes this attraction unique is a 300-foot tall Incline tram that you'll ride up the mountain to the courses. At one point in time there was a Bunny Golf that featured - get this - live bunnies. Sadly, Bunny Golf is no more due to the unfortunate bunny slaughter that took place. It was a sad ending to an unusual attraction. Gatlinburg, TN - getting a lot of use out of this one picture. Think of Gatlinburg as the quaint mountain village, but not really so quant and perhaps, to most folks, quite cheesy. However there is a charm to the town, and it's surrounded by the foothills of the Smokies so there's a real beauty to the place (at least when you look up). Here you'll find a few mini-golf courses and several haunted houses (included the Mystery Mansion, a haunted mansion themed attraction that has its guests roam around, from room to room, where there may or may not be human actors waiting to scare you). In the 90s, there was a great fire that burned down the original Ripley's museum. In the embers of the fire spread the seeds of Ripley all over Gatlinburg sprouting a new museum, a Motion Theater, Aquarium and several other Ripley-themed attractions. climb a rope to access the second level. The Ripley's Believe Or Not Museum gets my highest recommendation for this town. I should add there's a caveat as things in Gatlinburg are honestly not that incredible, so don't expect to have your mind blown or skirt blown up or down, or whatever, when you come here. However it's a fun way to blow at least an hour seeing all of the oddball attractions Ripley has collected over the years. Surprisingly Gatlinburg only looks like a series of lights at night. There is also a Sky Lift and ski "resort" here. You might be surprised to learn that the Sky Lift does not take you to the ski resort. You can get to the ski resort via the Ober Gatlinburg Aerial Tram. Here you'll find ski slopes (complete with snow making towers that fire large chunks of ice at great speeds), a really cool alpine slide, MORE mini-golf and other attractions to blow your money. The Sky Lift itself is a slow moving thrill ride that takes you up a nearby mountain to a t-shirt stand. There are a number of attractions to do here including buying t-shirts, buying an overpriced picture of yourself that captures the very moment you realize that the sky lift is only taking you to a lousy t-shirt shop, and a view of Gatlinburg and the Smokies. Seriously, only do this if you're bored and want to kill some time. There are a handful or more pancake joints and some really mediocre to decent motels to stay in. Seriously, there seems to be one hotel in this town that's rated 3-stars, otherwise everything is in the 2.5 and lower range. This doesn't mean there aren't some fairly nice places to stay. I recommend the Best Western Zoder Inn which is nestled along the Roaring Fork. The rooms are a bit dated, but there's nothing better than having the sounds of a roaring mountain stream to fall asleep to at night. Plus the hotel throws in free wine and cheese each evening, and milk and cookies before bed! Also, a trip to Gatlinburg simply isn't complete without eating some mountain fudge! I'm not sure what it is about the mountains and fudge, but you'd think it literally oozed out of the streams as you can't seem to go to a mountain village without someone peddling some hard brick-shaped chocolate. Finally, Gatlinburg is, for some inexplicable reason, home to approximately 1,000 ninja shops selling stars, swords and airsoft weaponry . So if you find yourself having a hankering for some fudge and an airsoft M-16, Gatlinburg is your place. This represents everything you need to know about Pigeon Forge. Pigeon Forge is, well, really just one long strip mall. The town primarily consists of the vaguely named Parkway, a 6-lane highway that runs down the center of the valley. Crammed along each side of the Parkway are the majority of the mini-golf and gocart tracks to be found in the area. You'll also find various bungee jumps and sky coasters and other odd attractions that all seem to involve propelling, slingshotting, or dropping humans at great speed. Oh, and there are many, many more pancake places here as well. Pigeon Forge is also home to Dollywood, a wonderful (and I'm not being sarcastic here) theme park home to a nice collection of thrill rides and some truly wonderful food. There are also a number of shows here that might strike your fancy, but sadly this writer hasn't seen any of them. Finally, Sevierville used to be that small hometown of Dolly Parton that you had to travel through to get to the good stuff in Pigeon Forge, Gatlinburg, and, oh yeah, that little National Park that attracts more visitors than any other. Today it has grown to be a land of large musical theaters (the great country/gospel musical theatre craze that once took over Branson moved here earlier this decade), many more motels and restaurants, and some of the larger attractions in the area including a Nascar Speedpark, a Wonderworks that appears to be some sort of "imagination" museum who's building is literally upside down, and a giant waterpark resort. There is also a Black Bear Jamboree (which by the look of their website contains ZERO bears) and the nicer of the outlet malls in the area - the Tanger Outlets. And if you're really, REALLY in to apples, there's the Apple Barn Farmhouse. And, as the saying goes, an apple is truly greater when consumed in a barn. Sadly, this extremely long blog post only cracks the surface of the many things you can do in the area. In future posts I'll highlight some of my other favorite attractions to do in the area. Kind of wish I had read this sooner!